Discovered in 1890, this is a geographical group of L. martagon endemic to the Urals and Siberia into the Lena region and into Mongolia. It was originally described coming from Irkutsk in the southeastern portions of Siberia where it is found scattered in grasslands and more commonly found in wooded thickets. It has been reported that grazing and plant collectors have decimated this rare beauty as well as from being harvested as a food crop. It is recognized by its smaller leaves and stouter, �woolly� stem. Our photo was graciously provided by Paul Christian of Rare Plants in the United Kingdom. 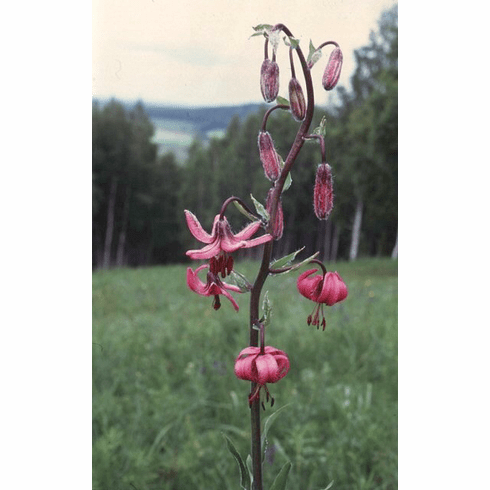 He can be located on the web at https://www.rareplants.co.uk were he offers not only lilium species, but also a nice selection of other �intriguing� goodies for the garden.